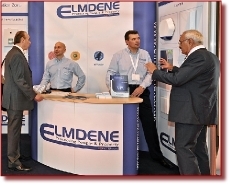 Innovative electronic security and fire products manufacturer, Elmdene International Limited - a subsidiary of Potter Signal, LLC - reports that it has had an extremely successful IFSEC 2012 with a strong level of footfall on stand. Visitors were especially keen, according to Elmdene, to see the PoE (Power over Ethernet) solutions which were on show for the first time; a flexible GSM version of its award-winning Merlin MGD-S graffiti detector, and the fast expanding range of energy efficient switch mode PSUs (Power Supply Units) for security, access control and fire applications. When it comes to Power over Ethernet (PoE), the premiering of a range of Elmdene's highly capable standby PSUs at IFSEC 2012 certainly grabbed the attention of visitors. When deployed these offer an important safety net for PoE devices that are increasingly being used in mission critical security, access control and IT applications. The standby units, which come as either mains or PoE powered, provide reliable battery back-up in the event of a power loss and also, crucially, offer a cost effective solution to deliver power to systems out in the field. its portfolio by launching the latest EN2 and EN3 products. The PSUs are designed to supersede older linear models while retaining the functionality that made the previous variants so popular. Also part of Elmdene's expanding switch mode offering unveiled at IFSEC 2012 were a number of new 24V units introduced to replace the BM and N ranges. Following the award-winning success of the Merlin graffiti detector at last year's IFSEC, Elmdene was back with a new wireless - GSM – standalone, rapidly deployable version. This wall mounted unit has the same ability to identify the sound of an aerosol spray can being activated, in typically 5-8 seconds, but offers even greater flexibility in terms of set-up and movement to key graffiti hotspots and can be configured to send a text message to alert security personnel when the detector has been activated. Said Justin Roberts, Sales and Marketing Director: "We have been pleased with the way this year's show has gone. Given the role that Power over Ethernet systems now play it is perhaps not surprising that considerable interest was being shown in our new standby PSU models. We believe these offer a robust, and cost effective, solution to support the operation of such systems and peace of mind should a power outage happen. Switch mode technology remains a major focus for us and IFSEC provided an ideal opportunity to showcase new models and to highlight the cost in use benefits that can be delivered - with bottomline energy savings of approximately 40% to one third - when deployed in preference to older linear models. "The Merlin graffiti detector was also still very much the centre of attention, especially now that the GSM version is coming on stream. Merlin is an ideal option to cover graffiti prone environments like the transport infrastructure, public spaces, housing developments and commercial sites."